Cassini continues its exploration of the Saturn system with the 6.5-day Rev 291, which begins on August 30 at its farthest distance from the planet. This is also called the orbit’s apoapse. At this point, Cassini is 1.22 million kilometers (0.76 million miles) from Saturn’s cloud tops. Rev 291 is the 21st of 22 proximal orbits that will take place between April 2017 and the end of the mission in September. During these orbits, Cassini’s closest approach to Saturn occurs between the ring system and Saturn’s atmosphere. Nine ISS observations are planned for Rev 291, with most covering Saturn’s atmosphere and the small moon Thrymr. 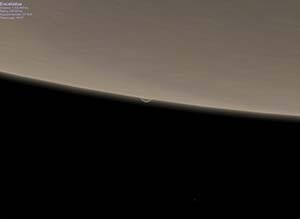 For its first observation of Rev 291, on August 30, ISS will observe a crescent Titan from 1.59 million kilometers (0.99 million miles) away to continue monitoring seasonal changes to its upper haze layers. Similar high-phase Titan observations are planned for August 31 and September 1. After the August 31 observation, ISS will ride along with the Composite Infrared Spectrometer (CIRS) to observe Saturn’s limb. CIRS will be looking at evidence for ring rain, water molecules and dust falling inward from Saturn’s main rings, on Saturn’s upper atmosphere. On September 1, the Ultraviolet Imaging Spectrometer (UVIS) will acquire a pair of Saturn’s north polar auroral ring observations. On September 2 at 13:17 UTC, Cassini will reach periapse for Rev 291 at an altitude of 1,565 kilometers (972 miles) above Saturn’s cloud tops. This is the fourth of five final passes where Cassini dips into Saturn’s upper atmosphere. On the inbound leg, UVIS will observe Saturn’s limb to provide a remote measurement of the composition of Saturn’s upper atmosphere, to compare to the in-situ measurements that the Ion and Neutral Mass Spectrometer (INMS) is acquiring during these last five periapses. The Visual and Infrared Mapping Spectrometer (VIMS) will conduct a similar remote measurement of Saturn’s upper atmospheric composition by observing a stellar occultation by Saturn and its rings of the red giant star Gamma Crucis. 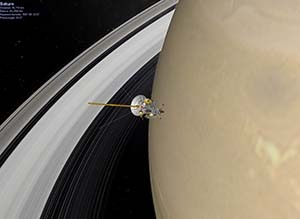 At closest approach to Saturn, INMS will conduct another direct measurement of Saturn’s upper atmospheric composition at closest approach, measuring the densities of molecular hydrogen, helium, and various ions. ISS will ride along with INMS, taking high-resolution images of Saturn’s atmosphere. On the outbound leg, UVIS will acquire a pair of observations of Saturn’s south polar auroral oval, currently unilluminated by the Sun during polar winter. ISS will ride along with one of these. On September 3, 4, and 5, ISS will acquire a series of observations of Thrymr, a small, distant moon of Saturn. At only 6 kilometers (3.7 miles) in diameter and at over 14.4 million kilometers (8.9 million miles) away, Thrymr is too small and distant to see the moon as anything more than a faint point of light amidst the background stars and cosmic ray hits. However, variations in the moon’s apparent brightness across the more than 35 hours of total observation time can provide information about the moon’s rotational period, the orientation of its spin axis, its rough shape, and its color. On September 4, ISS will observe the E ring at high-phase angles, a lighting geometry that helps highlight the diffuse dust particles that make up the E ring. On September 5, Cassini will reach apoapse, bringing Rev 291 to a close and starting up the next orbit, Rev 292. At this point, Cassini is 1.22 million kilometers (0.76 million miles) from Saturn’s cloud tops. During Cassini’s last full orbit around Saturn, ISS will acquire 19 observations, with the majority focused on Titan. On September 6, ISS will spend nearly 15 hours staring at Saturn’s narrow F ring. 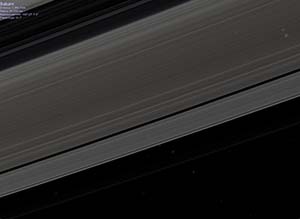 The time-lapse movie from this observation is designed to monitor features in the ring created by the gravity of nearby moons and ring clumps. 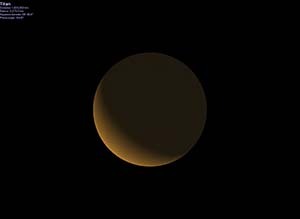 On September 7, ISS will image a crescent Titan from 1.79 million kilometers (1.11 million miles). Afterwards, ISS will ride along with CIRS during a pair of observations of the Cassini Division, the gap between Saturn’s A and B rings. ISS will also observe the outer A ring and the F ring as Prometheus passes through the field of view. Afterward, ISS will conduct a survey of the propellers in the outer A ring. Propellers are voids in the ring created by the gravity of large, 100 – 1000-meter (328 – 3280 foot) ring particles. Due to the influence of the rings on their motion, these observations are needed to keep track of previously discovered propellers, like Earhart and Bleriot. On September 9 at 00:16 UTC, Cassini will reach periapse for Rev 292 at an altitude of 1,628 kilometers (1,012 miles) above Saturn’s cloud tops. This is the last of five final passes where Cassini dips into Saturn’s upper atmosphere. On the inbound leg, VIMS will acquire a near-infrared map of Saturn’s northern hemisphere. Afterward, VIMS will conduct a similar remote measurement of Saturn’s upper atmospheric composition by observing a stellar occultation by Saturn and its rings of the red giant star Gamma Crucis. Earlier, CIRS will observe the same longitude on Saturn sampled by VIMS to measure helium abundance. At closest approach to Saturn, INMS will conduct another direct measurement of Saturn’s upper atmospheric composition at closest approach, measuring the densities of molecular hydrogen, helium, and various ions. ISS will ride along with INMS, taking a Wide-Angle Camera (WAC) movie of the rings from between the rings and Saturn. Outbound, UVIS will acquire its last observations of Saturn’s south polar auroral oval. On September 10, ISS will observe a half-phase Titan from 724,600 kilometers (450,250 miles) away to monitor clouds across Titan’s northern, sub-Saturn hemisphere. 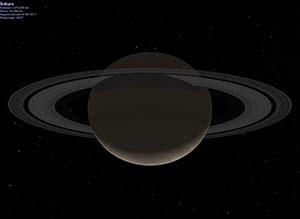 VIMS and CIRS will then acquire a pair of observations of Saturn’s atmosphere. On September 11 at 19:04 UTC, Cassini will perform a non-targeted encounter with Titan at a distance of 119,050 kilometers (73,970 miles). In addition to conducting science observations using ISS, CIRS, RADAR, and VIMS, Cassini will use this encounter to put it on a trajectory that takes it into Saturn four days later. ISS will acquire a series of mosaics during the encounter, including a 23-frame mosaic that will be taken during closest approach. This mosaic, CLOUD002, will start over Titan’s Fensal region and will cover the moon’s north polar region near closest approach. Inbound, ISS will acquire a pair of mosaics covering Titan’s leading hemisphere, including the Menrva impact basin and Fensal. 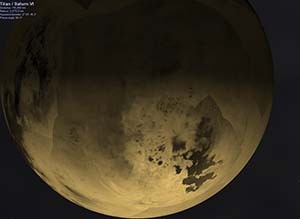 Outbound, ISS will take mosaics of Titan’s north polar region and the moon’s largest hydrocarbon sea, Kraken Mare, and later, the sub-Saturn hemisphere. These mosaics will be used to track cloud activity across the moon’s northern hemisphere as well as improve mapping of the region east of Kraken Mare. CIRS, between these mosaics, will acquire mid-infrared maps of Titan’s northern hemisphere to measure compositional and temperature changes in Titan’s atmosphere resulting from the transition to northern summer. Shortly after closest approach, RADAR will acquire its final observation, an altimetry swath across a few small lakes near 70 degrees North Latitude, 180 degrees West Longitude. ISS will observe these lakes at closest approach during the CLOUD002 mosaic. On September 12 at 05:37 UTC, Cassini will reach apoapse, bringing Rev 292 to a close and starting up its final, half orbit, Rev 293. At this point, Cassini is 1.22 million kilometers (0.76 million miles) from Saturn’s cloud tops. On September 13 and 14, Cassini will acquire its final remote sensing observations. 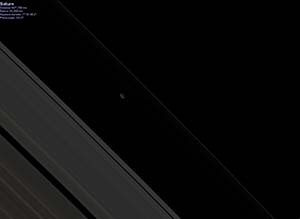 First, ISS will acquire a WAC mosaic of Saturn and its main ring system. Next, ISS will acquire a “Kodak-moment” observation of Enceladus as it passes behind Saturn’s north polar region. ISS will then observe a half-phase Titan, monitoring clouds across its northern sub-Saturn hemisphere from 770,700 kilometers (478,900 miles) away. Afterwards, UVIS will acquire its first of two ultraviolet scans of Saturn’s north polar auroral oval and northern hemisphere. On September 14, ISS will observe “Peggy”, a clump of ring material on the outer edge of the A ring first seen by Cassini in 2013. After a second UVIS auroral scan, ISS conduct its final survey of the propellers in the outer A ring. For Cassini’s final remote sensing observation, VIMS, with ISS riding along, will observe Cassini impact site while it’s on the planet’s nightside. ISS will be observing the area using ringshine. After the VIMS observation, Cassini will turn for one last data playback. Cassini will continue to transmit data to Earth as it approaches Saturn, acquiring and transmitting CIRS and in-situ measurements in near-real time. Cassini will enter Saturn’s atmosphere at 10:44 UTC on September 15, or 12:07 UTC Earth-Received Time. Loss-of-signal is expected a minute later as the density of Saturn’s atmosphere increases around Cassini, inducing torques on the spacecraft too strong for the on-board thrusters to counteract and keep the antenna pointed at Earth. Shortly afterward, Cassini will be no more as it burns up like a meteor in Saturn’s sky.